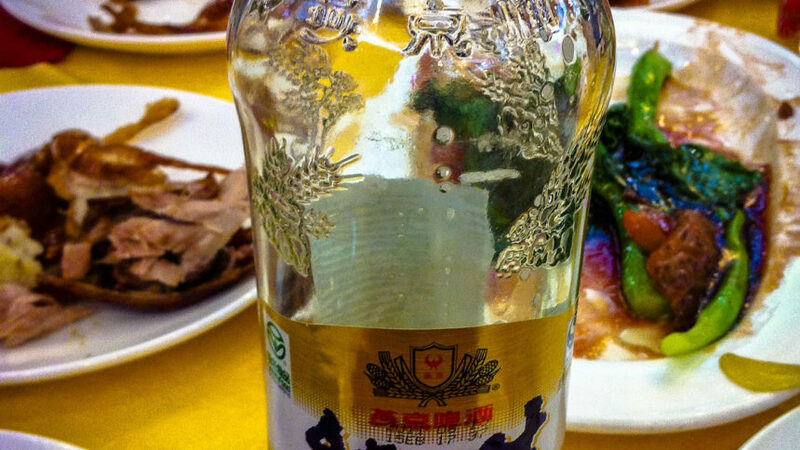 When I picked an identifying image for Beer For Strange Climates 60 posts ago, I recalled the mysterious yet everyman’s beer I had to wash down a memorable meal in Beijing several years back. That meal? Beijing Duck–the most famous of China’s exported cuisine. You probably know it as Peking Duck stateside, but that name would be nonsensical here. 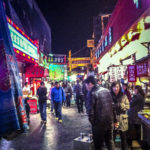 Its lacquered beauty’s well worth seeking out–and hundreds of restaurants in Beijing’s central business district will compete for your yuan. Our guide, whom we called by her nickname Wendy, had her favorite, and we salivated in anticipation as the hefty trolley wheeled up and a masked chef very hygienically sectioned out our collective birds. I took delight in the crispy skin, with its layers of subcutaneous insulation rendered into melting, mouthfilling fatty yumminess, while my table companions sought out the tender flesh adorned simply with a bit of (what else) housemade duck sauce, and greens deeply steamed with garlic–Chinese greens became a favorite over the course of this, my first business trip to China. 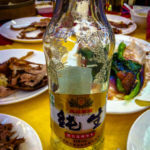 We washed it all down with a popular lager–it was on every table–with cheers and down the hatch! 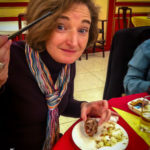 Later that evening, as we walked back to the hotel, stall-sellers offering crickets and other delights on a stick tempted us, but our bellies still rounded with that gorgeous duck.